My roommate and I have been creating our own original costumes for 4 years now and entering the costume contests. We tried looking online for a picture of a hydrant costume (so that we had some ideas on how to create it), but no luck there. 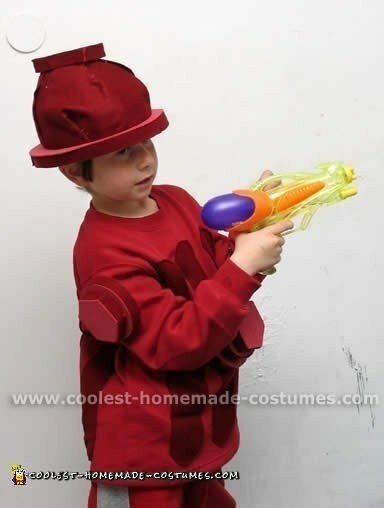 This doesn’t only have to be a child costume. We used a few cardboard boxes. We bought red and black paint, a roll of duct tape, and some yellow tissue paper. For the dog costume my roommate used an old white sweat suit and a white knit hat. We also got some face paint, which is VERY easy to find that time of the year. We began construction on the hydrant about 2 weeks in advance because we knew it would be time consuming. First we rolled the cardboard over and over to squish it up and make it flexible. Then once we had it soft, we painted it red (it needed 2 coats because of the cardboard soaking it up). Then, we tied the back of it together like a corset to keep it round and braced the inside with metal hangers. For the sides and front, which was the face hole, we just used cardboard and attached it with duct tape. For the top of the hydrant we used a large mixing bowl and covered it with yellow tissue paper since paint would not stick. We then used a smaller bowl on top of that and a little Dixie cup on top to top it off. We tried for authenticity by adding a paper chain to the sides and front and just like that we had ourselves a fire hydrant. The dog costume was much easier. We used black paint and put random spots all over the hat and sweat suit. The entire process took us about one week – but it sure paid off! We won the most original contest and drew quite the crowd to check it out. We were also featured on the front page of the University Newspaper. 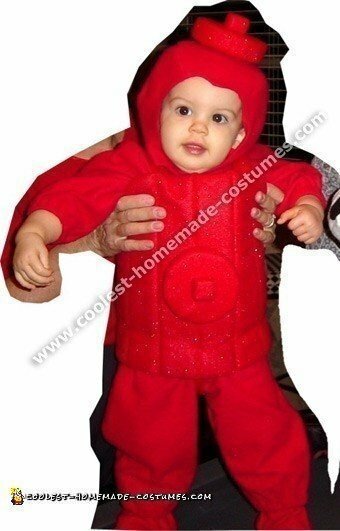 Even one of the judges asked how we did it because she wanted to make a child costume for her son! It was inexpensive and very simple to make. We just used our heads and had a fun time doing it. Thanks for having this great site to post costumes and ideas on! It’s just not right that these works of art get one day of glory and then are forgotten! Hopefully this will give someone else some ideas someday. Because I have twins I tried to think of costumes that would go together, but would also be unique and out of the ordinary. 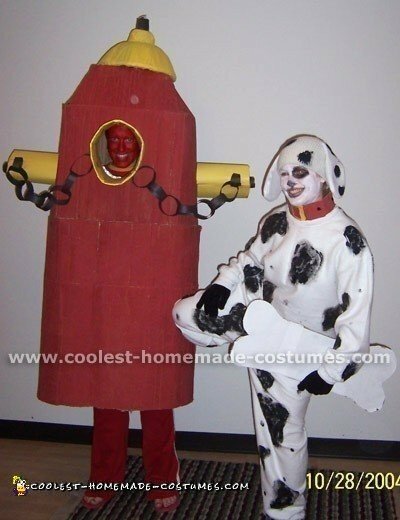 I came up with the idea of a Dalmatian dog costume and a fire hydrant child costume. I am not sure where the idea came from, but it was fun to do. The fire hydrant was made with the same pattern except leaving off the tail and ears. I also used polar fleece for it. The actual hydrant is made out of foam that I covered with red fabric and put straight seams in to make the ridges. 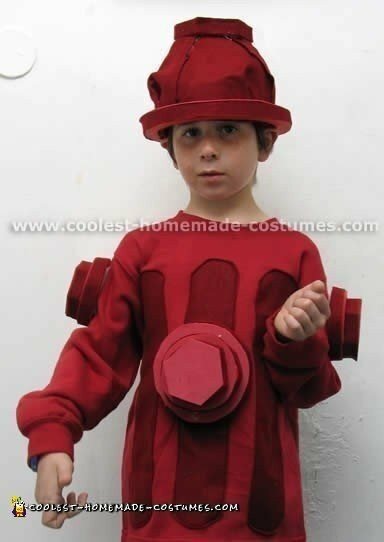 The "valve" part of the child costume is made out of cut Styrofoam and covered with felt and then hot glued to the rest of the child costume. The foam part of the costume is held on with Velcro so it was easy to remove. They were a lot of fun to make and needless to say they were unique.